What type of in-ground swimming pool should I install? Before you started, you might not even have know there was more than one way to build a pool. And the type of pool you build can impact the cost; design; maintenance and installation time. Swimming pool construction can be a big investment, both in terms of time and money, so you want to make sure that you are completely happy with your finished pool. What are the options for in-ground swimming pool construction? Over this series we are going to look at the three main types of in-ground pool construction. Within each of these, there are variations. This post will look at the advantages and disadvantages of the one-piece pool. READY FOR A ONE-PIECE POOL QUOTE? You might hear the terms one piece and fiberglass and polymer pools being used interchangeably. Some companies will say they install Fiberglass for ease. When really they install one piece pools made of something else. It can all get a little confusing. On the surface they all have a smooth, surface made from polymer on vinyl resin. Some are backed with fiberglass to strengthen them. Some use other substances. One piece pools are named so, because they are fully made in a factory. And then they are (usually) delivered in one piece. However, some manufacturers now offer larger sizes that arrive in multiple pieces and are welded on site. But the fabrication of these pieces still takes place off-site. 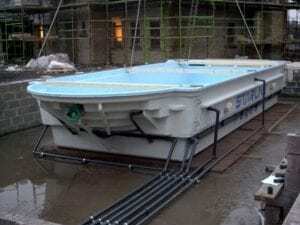 They are pre-assembled, with all the optional finishes such as skimmers, underwater lighting, and jets pre-manufactured in the factory and delivered completed to site, ready to be installed. One piece pool technology has improved vastly over the last few years. Making these models of pools increasingly popular. So what is great about them? We look at the pros and cons to help you decide whether this is the correct pool type for you. There are many advantages to one-piece pools that make them an excellent choice for many people looking to build a pool. As mentioned above, the one-piece pool is pre-assembled off site to your specifications. This makes the installation process extremely quick. Installation times are usually approx. 2-4 weeks on average one the pool arrives. This excludes excavation and ground works that are required. The one-piece pool has a smooth and non-porous surface, which reduces the chance for algae growth. This can help reduce the level of sanitiser and algaecide that is required to keep the pool clean. Plus need to stringently control the calcium hardness is also slightly reduced, in comparison to tiled pools, as there is no grout for the water to steal calcium from. Why did the Olympic swimming pool turn green? There are no tiles or liners to get damaged or fall off in a one piece pool. So there is little to go wrong within the pool shell itself. This will lower the lifetime investment required for the swimming pool. We still recommend ongoing preventative maintenance on the pool workings, however, the shell should last the life of the pool with no maintenance required. All in-ground pools are expensive to install. However, one-piece pools are the most cost effective of the pool constructions. This is due to the materials use, and the fact that the installation itself usually only takes a couple of weeks. One-piece pools cost on average approx. £60,000 – £80,000 depending on whether it is and outdoor or indoor swimming pool. However this will vary on size and customisation options. One piece pools are pre-built in a factory, and most manufacturers have pre-set designs that you choose from. So they are not 100% customisable. However they do come in many shapes and sizes. And there are usually a number of different design and customisation options so that you can make your pool your own. The whole pool is manufacturer off-site, indoors. This is especially helpful in Scotland for outdoor pools or indoor pools that do not have a weather proof building yet. 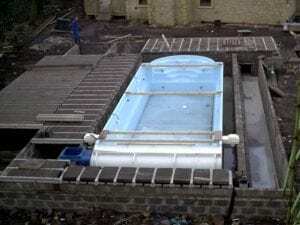 Pool constructions can be adversely affected by harsh weather. One-piece pools are constructed in a controlled manufacturing environment. So weather factors are not an issue. The more we work with them, the more we realise how great one piece pool constructions are. However, as with everything there are some drawbacks to one piece pools. 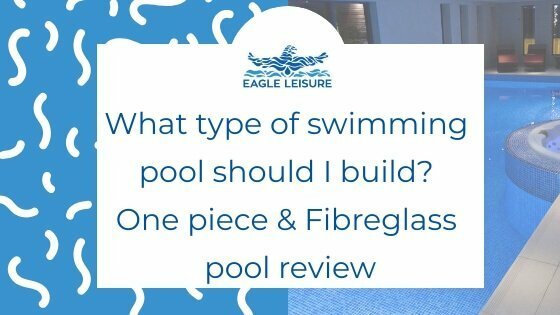 Although there are variations in the shapes and sizes available, as well as the customisation options, many one piece pools are build from a mould. This means that you may be limited to the shapes and sizes on offer from your chosen manufacturer. If you want a wild design you might find that you can’t find what you are looking for in a one piece pool. As most one piece pools are shipped in one piece via road they are limited in size. There is usually a width limit of 5 metres. So, if you want a very large swimming pool a one piece pool may not be suitable. However, some manufacturers such as Niveko, can custom build the swimming pool and deliver it in parts. This is then welded together on site. So you are not limited by size. Even typing that feels icky. Traditionally, one-piece pools have been thought of as the cheap pools of the swimming pool world. They look different ie. they don’t look tiled. And people that don’t install them brand them as glorified fish ponds (That’s just plain rude hun). You might have this perception. But we urge you to take a look at some of the installations on the Niveko. Take a look and tell us you don’t think they look ah-may-zing. Sure you can get cheaper one piece pools that don’t look as great. But a quality one piece of fibreglass pool isn’t cheap. And with a nice surround can look just as classy and luxury as a comparative sprayed concrete swimming pool. While still saving you money and time on installation and maintenance. Win, win in our book. One piece pools are an excellent choice if you are thinking abut getting a swimming pool. They have many benefits that make them one of the fastest, cheapest and lowest maintenance pool types available. And as such they are growing in popularity. If you are thinking about getting a one-piece pool we recommend visiting the Niveko one piece pool website and seeing what size, and customisation options they have available.